Reflect your unique style with custom mirror finishes and accents. 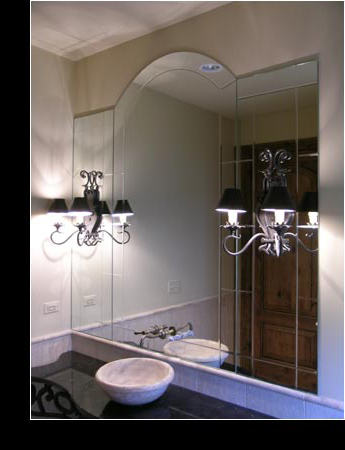 All our mirrors are custom cut to any style, shape and size. The trick to success is in the measurement process. We have unique methods of measuring to ensure a tight fit for each mirror. Backsplashes with many cutouts for outlets or notches for cabinetry are no problem. Workout room mirrors are always in perfect form. We can also install a ballet bar, providing both quality and convenience. From the same owners as Karesh Glass, LLC. we have a line of framed mirrors with timeless style and infinite possibilities in virtually ANY SIZE. Just click on the hotlink below to see our designer frames, color accents, custom cut edges and shapes, to reflect your own personal style. See Karesh Mirrors Unlimited Framed Mirrors.